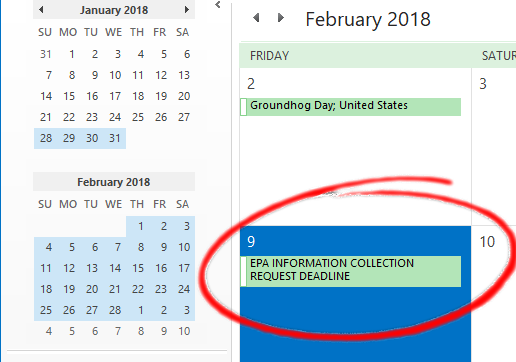 The US EPA mailed the ICR by registered mail to 391 facilities in the PCWP industry that are major sources for hazardous air pollutants (HAP) regulated by the PCWP NESHAP and synthetic area sources that may have used technology to avoid major source status triggering National Emission Standards for Hazardous Air Pollutants (NESHAP) applicability. Recipients are asked to complete the ICR by February 9, 2018. The information collection seeks to collect facility-level information such as: the mills general information, federal air rules applicable to the mill, production and product information, equipment detail, release point parameters, information of the operating permit, extensive information of the kilns, extensive information of the air pollution control devices, work practices, wastewater information, stack test results, HAP and Volatile Organic Compounds (VOC) emissions and Continuous Emissions Monitoring System (CEMS) data. The EPA will either establish an emission limit or work practices in order to minimize emissions for process units included in the PCWP Maximum Achievable Control Technology (MACT) source category. Capturing, controlling, and the measurements of kiln emissions is not feasible. Installing emissions capture and add-on control equipment for VOC/HAP removal have not been identified. It is therefore predicted that mills will choose to use work practice requirements in lieu of emission limits. Changes in kiln operating temperatures can significantly affect mill operations and drying capacity. Lower kiln temperatures result in longer drying times. This is a production and capacity issue for mills. A mill operating four lumber kilns at full capacity with temperature of 225OF would have to add two more lumber kilns to dry the same amount of lumber at 180OF.To overcome the potential Kiln MACT limitation, mills will need to prepare a compliance work practice plan that minimizes emissions with the least affect to drying capacity. CTI is experienced in assisting many mills in the permitting process that includes most of the information requested in the survey. CTI also has assisted facilities with ICR for other regulations in the past. Upon receipt of the ICR, feel free to contact us for a proposal to assist you to prepare it in a timely manner. If you have any questions or need additional information, please contact us.